These satellites had a dual function: The Solrad payload was a scientific radiation experiment, while Grab, also known by the Naval Research Laboratory's designation Dyno, was the first ELINT/SIGINT mission conducted in space. Grab was, when the name emerged, reported to be an acronym for "Galactic radiation and background", which, in fact, it never was. The "Galactic Radiation Background Experiment" (Grab) was a US Navy electronic intelligence (ELINT) satellite system that became operational in July 1960 and was operated until August 1962. Grab was officially declassified in June 1998 during the 75th anniversary celebration of the Naval Research Laboratory [NRL]. Grab obtained information on Soviet air defense radars that could not be observed by Air Force and Navy aircraft flying ELINT missions along accessible borders in Europe and the western Pacific. From 500 miles above earth, safe from surface-to-air missiles, the Grab satellite's simple, circular orbit passed it through the energy beams from Soviet radar whose pulses traveled straight and far beyond the horizon into space. The NRL Naval Center for Space Technology (NCST) designed and built the Grab satellite and a network of overseas data collection facilities. The first launch was approved by President Eisenhower in May 1960, just four days after a CIA U-2 aircraft was lost on a reconnaissance mission over Soviet territory. 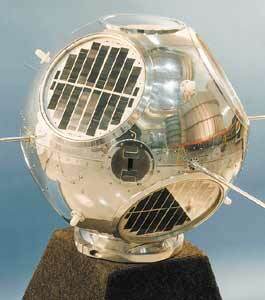 The Grab satellite got a free ride into space in June 1960 with the Navy's third Transit navigation satellite. Grab carried two electronic payloads, the classified ELINT package and instrumentation to measure solar radiation (SolRad). The SolRad experiment was publicly disclosed in DoD press releases on this and subsequent launches. Four more launches were attempted, and one was successful on 29 June 1961. Grab has been renamed Poppy in late 1961. The Director of Naval Intelligence exercised overall control. Secretary of Defense Robert S. McNamara formally established the NRO on 14 June 1962 by a top secret directive, and the Grab technology was then transferred to the NRO. All but Poppy-2/Solrad-4B were launched piggyback with Transit satellites or in clusters. The last satellite was never launched and was donated in 2002 to the National Air and Space Museum.